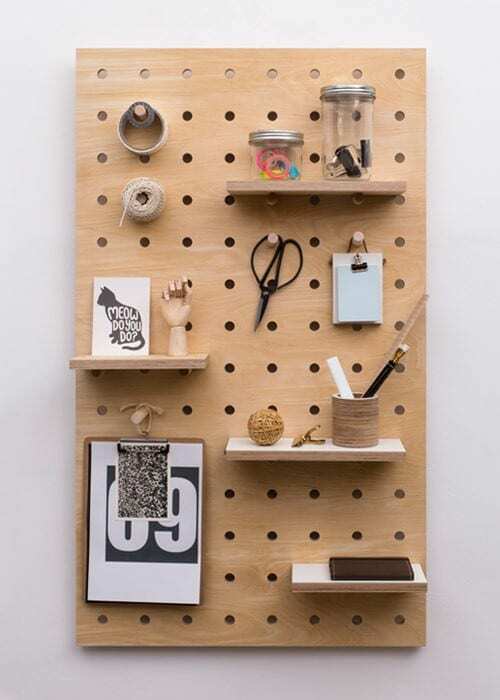 When it comes to upcycling and repurposing, you don’t usually think of pegboards as a go-to item. That being said, with a little creativity and problem solving, peg boards can actually be extremely useful. We scoured the Internet for some of their best uses. 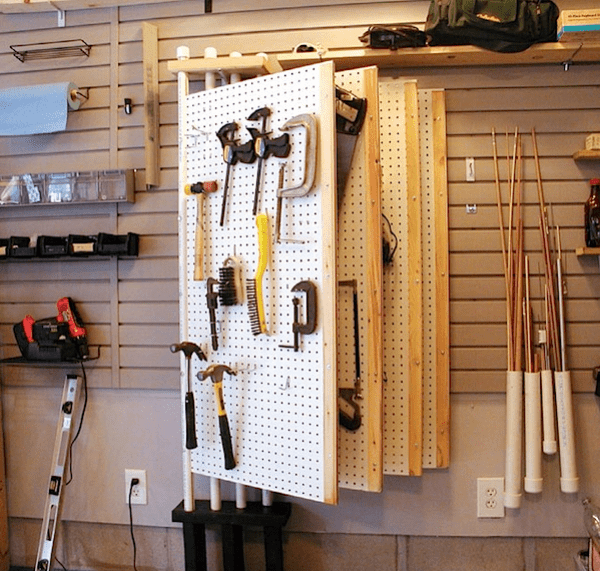 Pegboards are commonly used in the garage for organization and storage, but they don’t have to stay there. 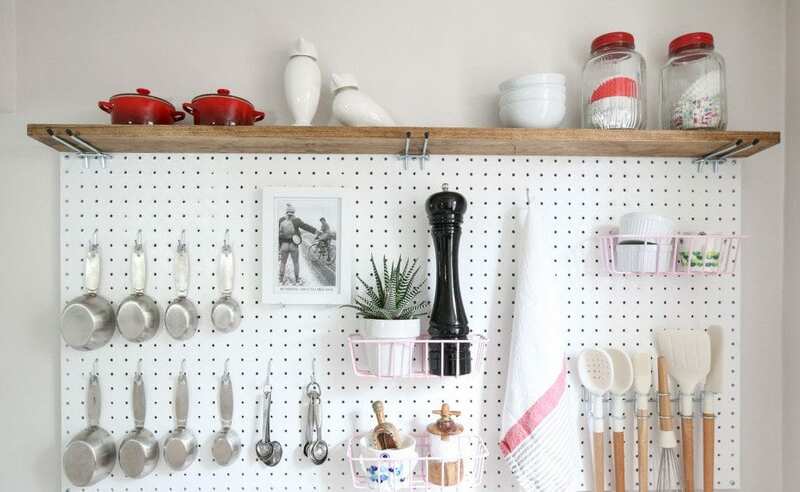 There are about a million ways for people to use pegboards around the house. Some will keep homes neat and tidy, and others are just for fun! This slideshow contains 45 of the best uses. They’re guaranteed to make organization, cleanliness and fun times much, much easier! 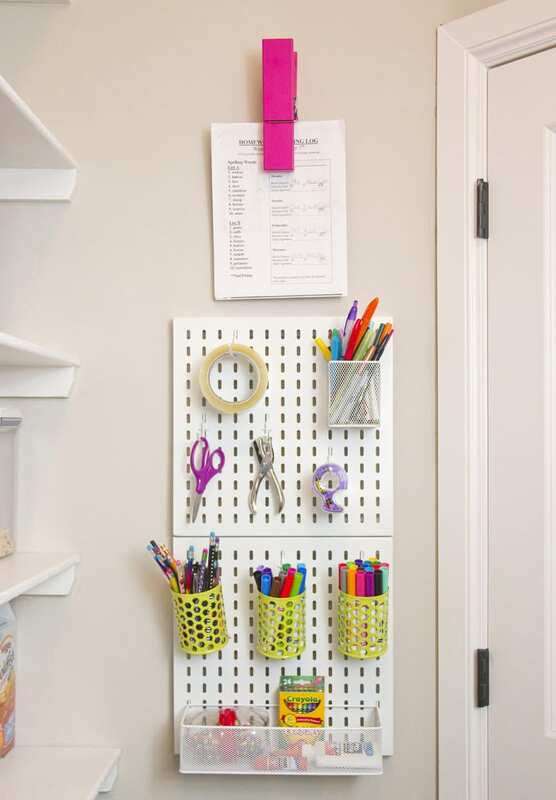 Do you know of any other great uses for pegboards? If so, let us know in the comments! 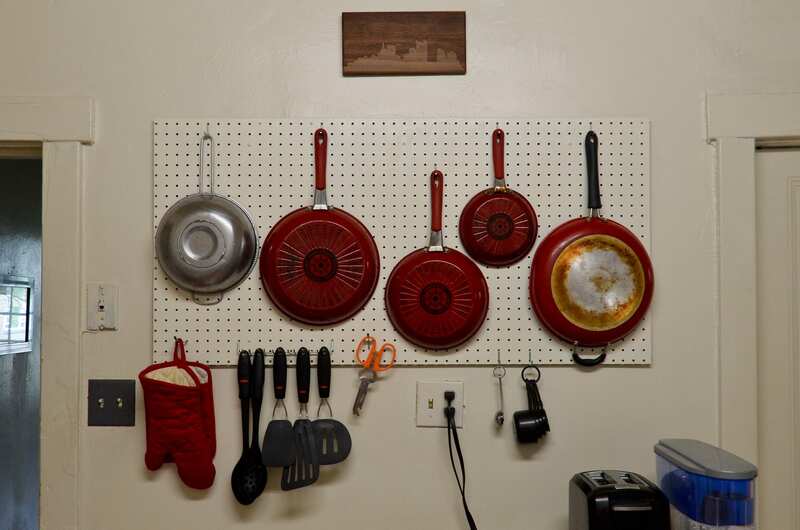 From your strainer and grater all the way to your pans, this pegboard can store everything. This is perfect for items that are oddly-shaped or too big to fit in your drawers or cabinets. 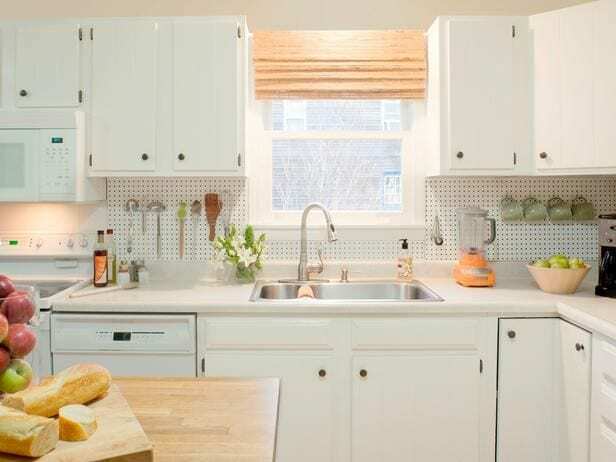 Use a pegboard to keep your kitchen tools nice and organized. Hang your teaspoons/tablespoons, measuring cups, spatulas, and more. This is especially useful if you have a small kitchen or lack space. Add a shelf on top for even more storage! 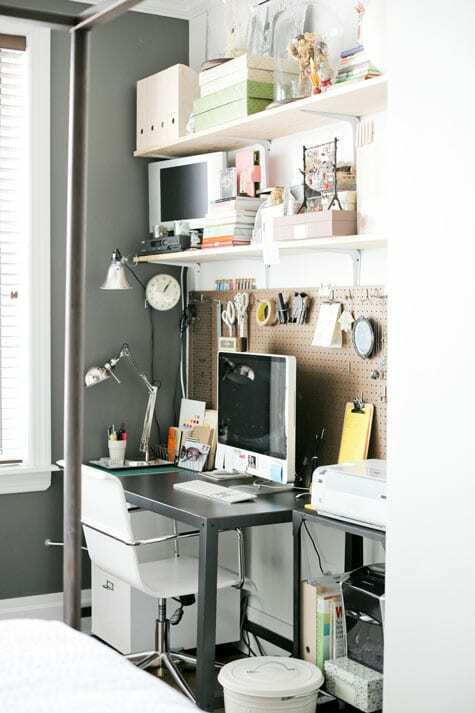 Rather than use shelves in your workspace, use a pegboard and hooks to store your practical equipment. Not only is everything visible, so you know exactly what to grab, but it also eliminates the need for drawers or dressers in small spaces. 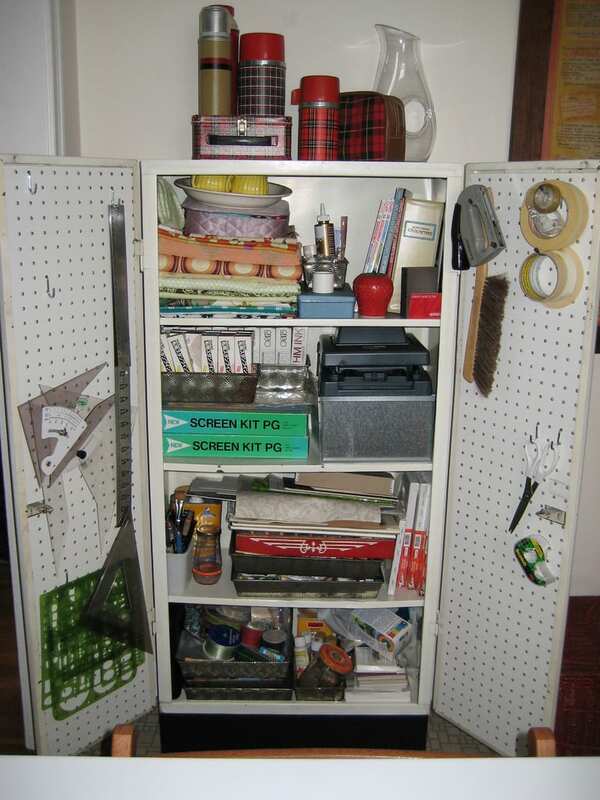 Hang a pegboard inside a cabinet door for smaller items and valuables. 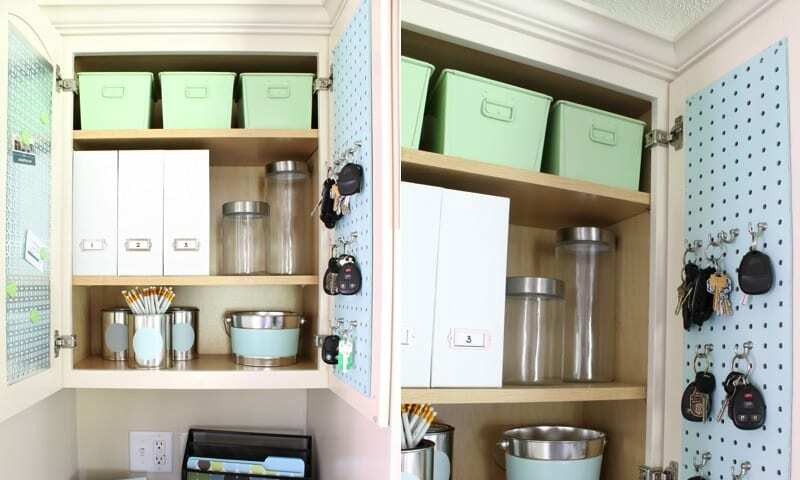 Or, you can hang your spoons, spatulas, and other kitchen tools here. 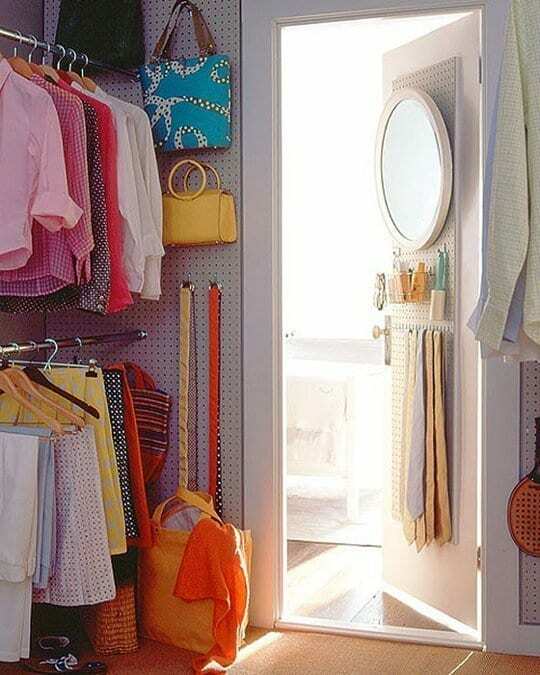 Doing this will essentially double the amount of space you have. 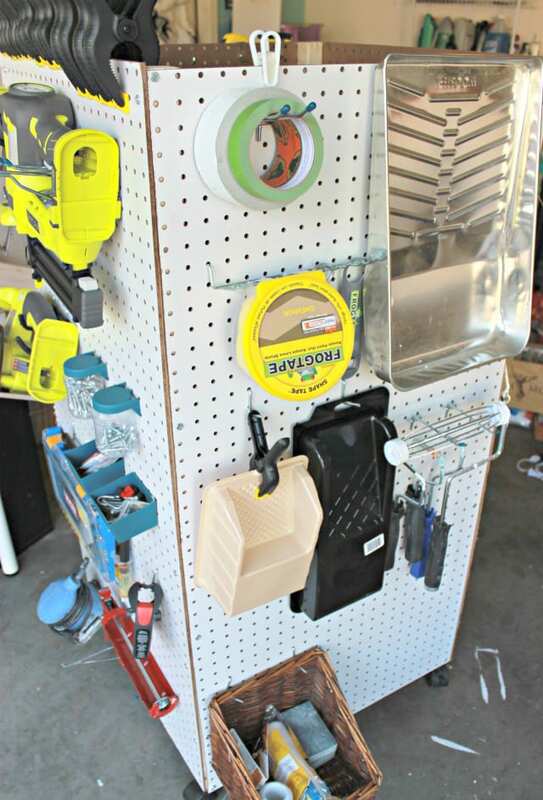 If you have a hobby like gardening, then use a pegboard to store all your tools and accessories in one place. This can be hung up anywhere in the house. It’s also a great way to display any antique or vintage tools you might have. Keep jewelry on display, even when you’re not wearing it! 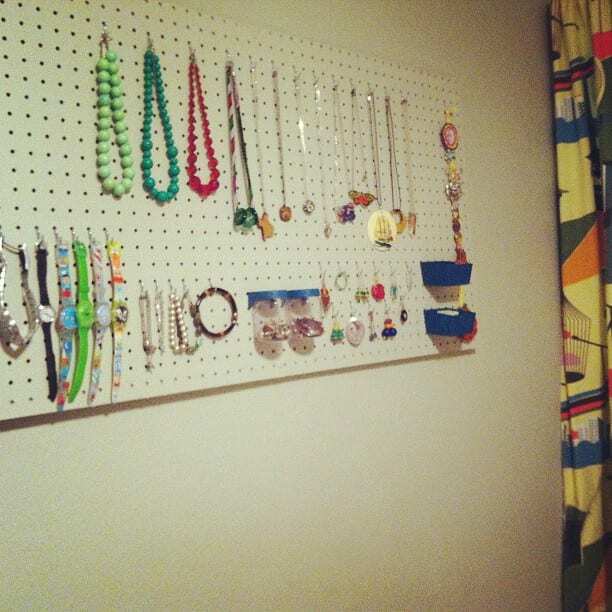 Attach a pegboard to the wall and use small hooks and pegs to hang necklaces, bracelets, and earrings. It’s also a great way to admire your collection! If you are an avid sewer, then you probably have numerous spools of different colors. 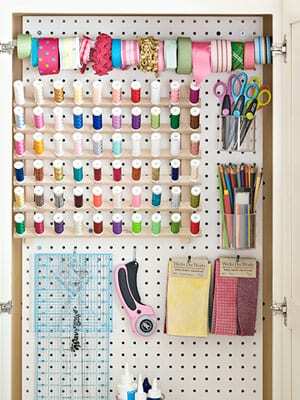 Keep them orderly and organized by color with a pegboard. Now, finding the color you want will be super easy. It will take your sewing space to the next level. 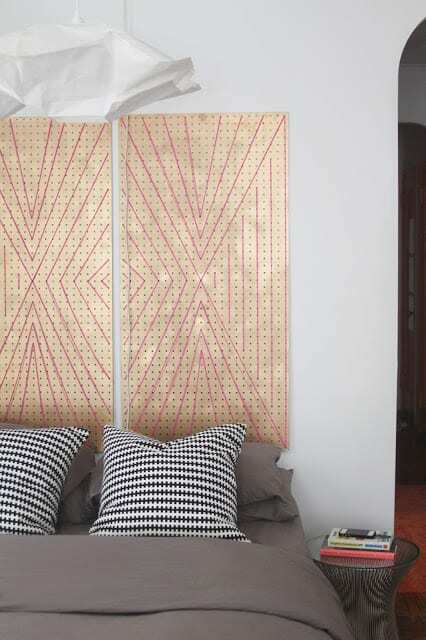 If you want an atypical headboard, then use your creativity with a pegboard and some string. The result will be unique and special to you. It’s also something that you can change after a few months if you want to switch up the design. You’ll actually want to clean when you see how nicely displayed your supplies are! This idea is perfect for the laundry room or a mud room. Dishes, plates and bowls won’t rattle around with this pegboard design. 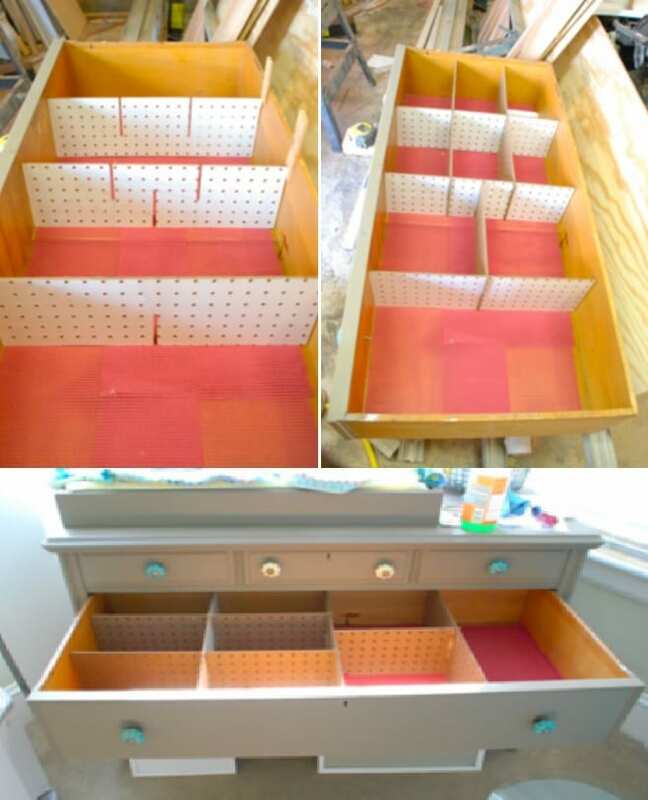 Place the pegboard into a drawer horizontally, and add pegs around your dishes. The pegs can be moved and re-organized whenever needed. 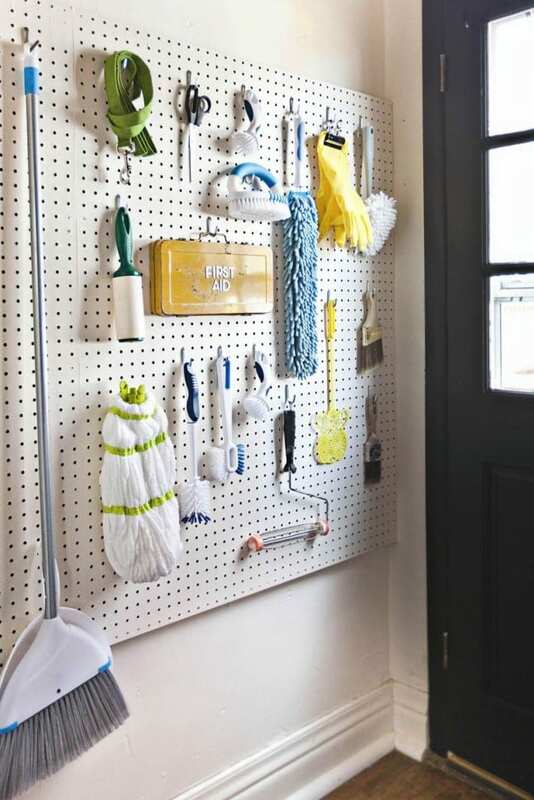 It doesn’t need to say ‘hello’ necessarily, but using a pegboard to store your going out essentials will make getting ready to leave much smoother. Paint, decorate, or cross-stitch whatever you’d like! It’s a super cute piece to welcome guests into your home. Children will have no excuse for putting off homework if their supplies are stored on this rack. Neatly display all of their school and craft supplies in a fun, creative manner. They’ll look forward to sitting down in their designated space. Are you tired of stuff being strewn across the floor of your closet? Put pegboards on the walls, and you’ll never have that problem again. Now, you can hang your bags, belts, and whatever else without taking up any extra space. Diapers rarely appear appealing. 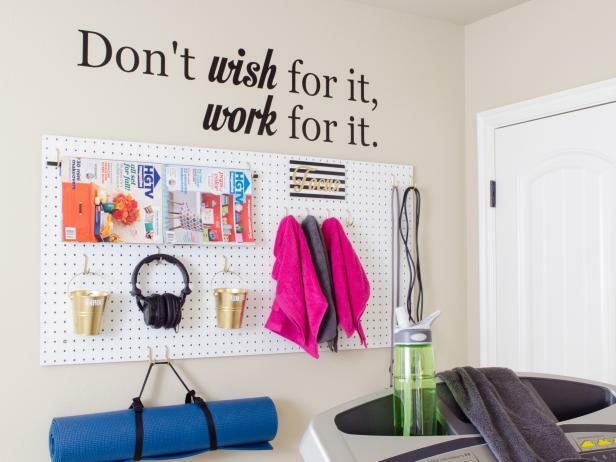 But when they’re hung up on this pegboard, they look great! 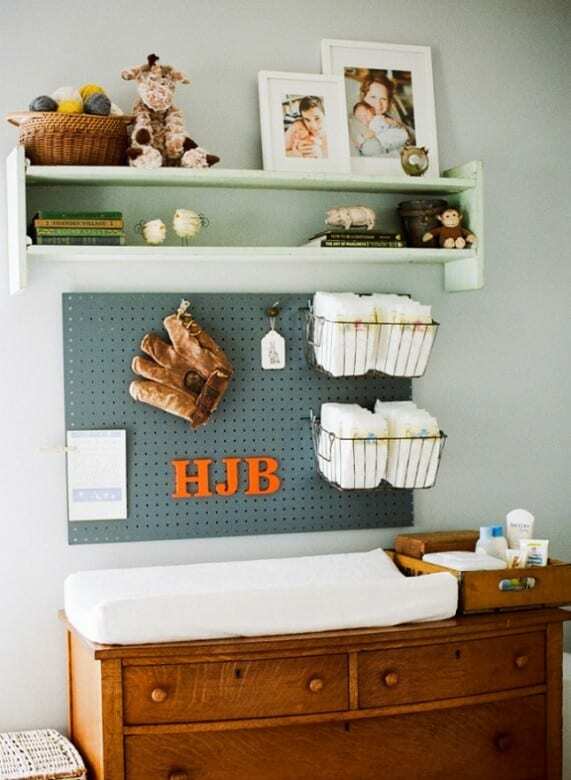 Create an adorable diaper changing station with a pegboard, some small racks, and other pieces of decor. As most sport gear is only used now and then, it has a habit of getting lost and cluttered. Not with this pegboard design. Now, all of the gear is organized, in plain sight, and pleasing to look at. 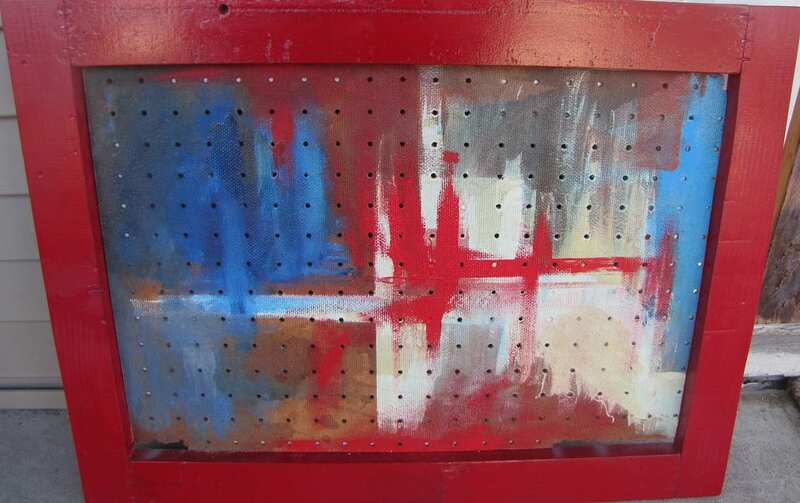 Let your inner Jackson Pollock run free and use a pegboard as an unconventional surface for your work. These make for great outdoor art pieces to display in your yard or on your patio. 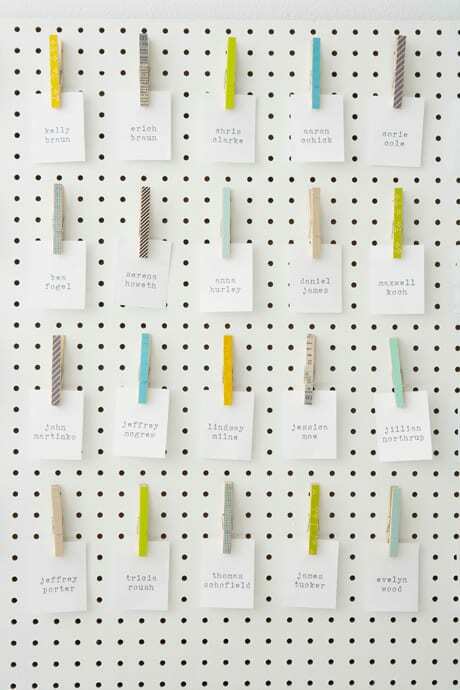 Sticking with art, the pegboard can be a really cool surface to hang all your artworks upon. Not to mention, the artwork can be easily switched out as often as you’d like. 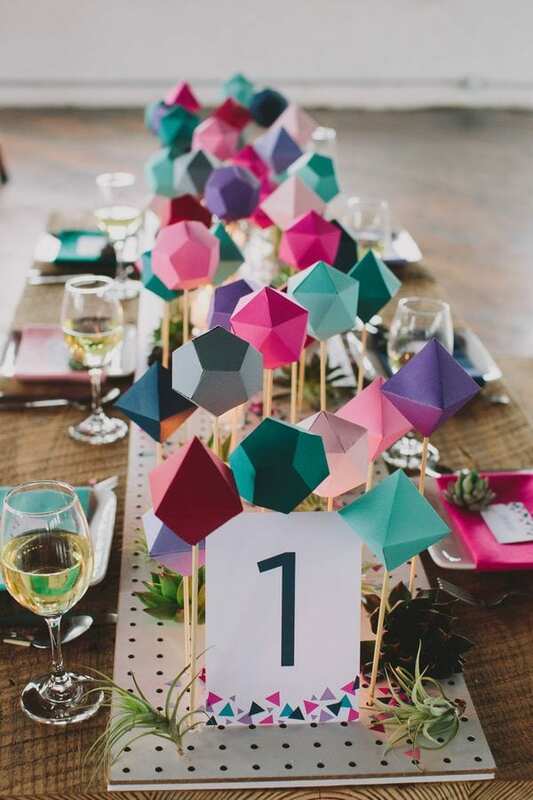 Pegboards allow you to create more impressive table centerpieces than ever before. Lay out a narrow piece of pegboard and use it to dispaly faux flowers, fun pieces of art, and table numbers. The pegboard will do two jobs in one here. It’s a handy backsplash for your sink, and it will allow for more kitchen storage space. You don’t have to leave it plain white either, paint it whatever color looks best! If you’re lucky enough to have a few exercise machines at home, then you should have a place to store the stuff you need for working out. And there’s no better item to use than a pegboard! Do you believe in the healing power of crystals, or just like to look at pretty rocks? 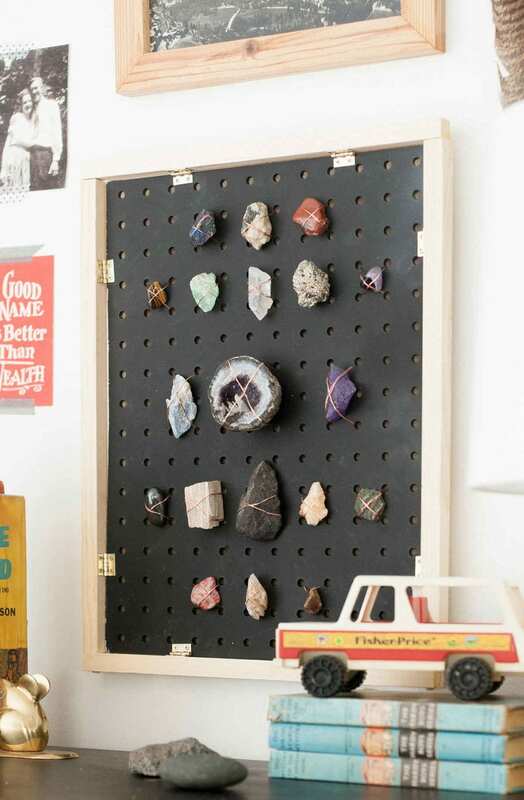 If so, then a pegboard can be the perfect way to store and display them. Some people hang shelves with piping. Others make floating shelves. But a pegboard looks really cool for shelf storage. Plus, shelves can be rearranged and added with ease. Do you wish that your desk was less cluttered? Then putting a pegboard behind it can really help. Taking advantage of the vertical space in small rooms and homes is perfect for adding more space. Like wallets, keys have a nasty habit of losing themselves. That doesn’t have to be the case if you place a small peboard somewhere where it’s handy to keep the keys. Put it right by your front door, or if they’re keys you don’t use very often, you can hide them in a cabinet. 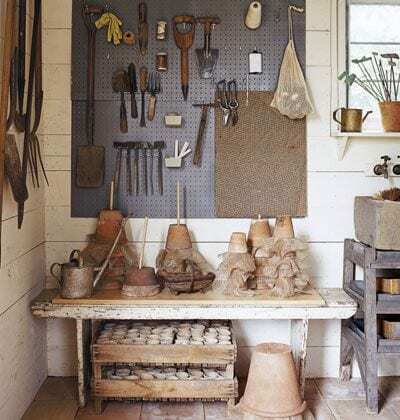 If you’ve got stuff you always need to move about a large area, such as gardening tools, then it can be a great idea to make a portable caddy for it, and build the walls with peg boards. You can trundle this around and keep your items organized. 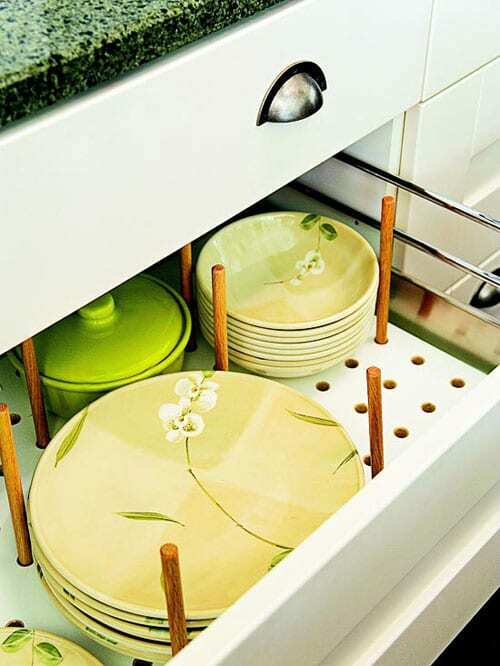 Not only will it make your drawer more organized, you can hang small items on the sides! Once again, they can be reorganized and added to whenever you need more or less space, depending on what you have in your drawers. 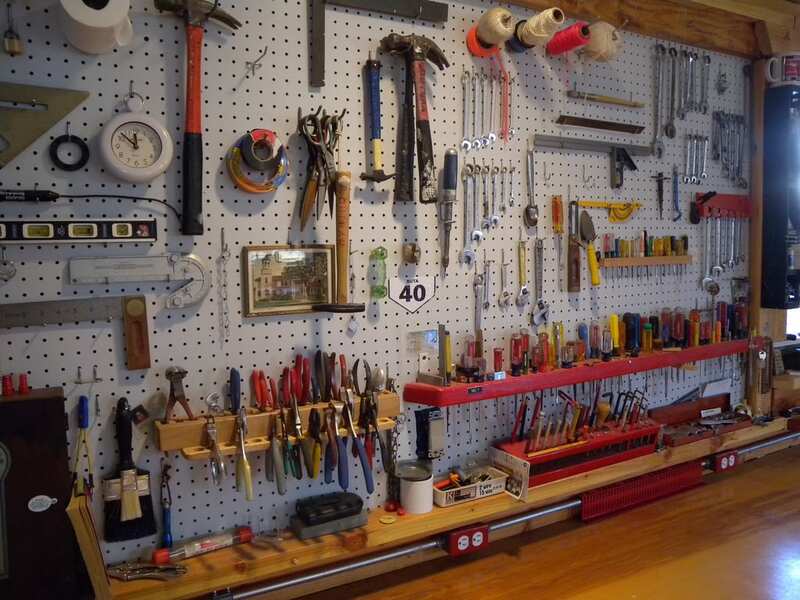 Sometimes, you don’t have the space to attach enough pegboard to store all your tools… or do you? 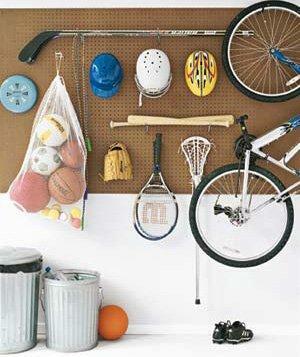 You can create a swinging pegboard leaves object to stack all your tools in a small space without them getting messy. 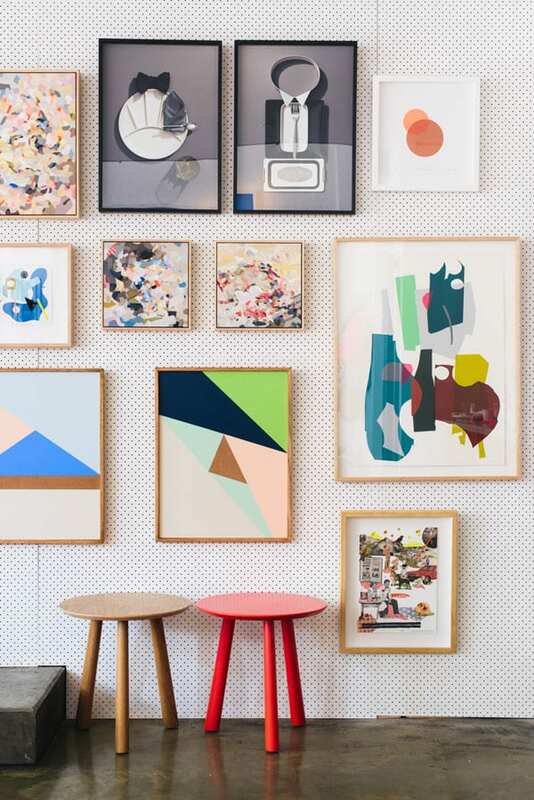 Pegboards look surprisingly beautiful when they frame artwork! 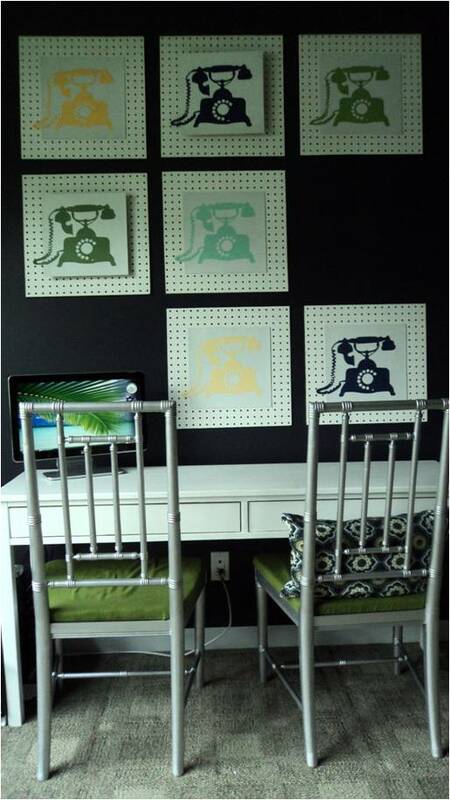 Get creative and paint the pegboards whatever color you’d like–or, you can leave them simple and white to let the art speak for itself. 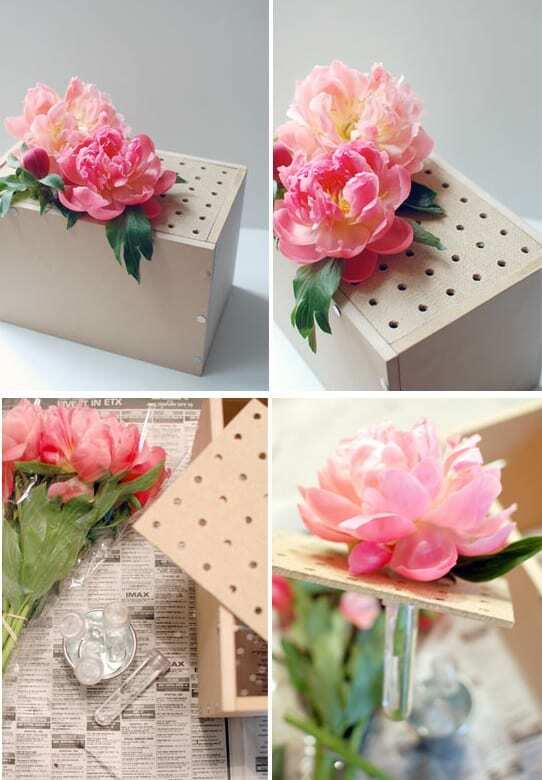 Who new that the humble pegboard could become a really unique looking flower vase! Just thread the stem through one of the holes or, like this idea, you can keep the flowers in small water containers to keep them fresh for longer. If you’re organizing a wedding or event that requires specific seating, then you know that it can be difficult to visualize the seating. 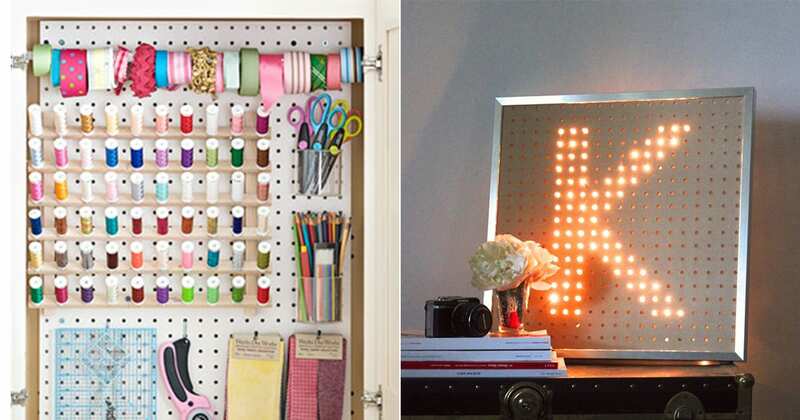 But with a pegboard, you can create a mini layout for the big day. 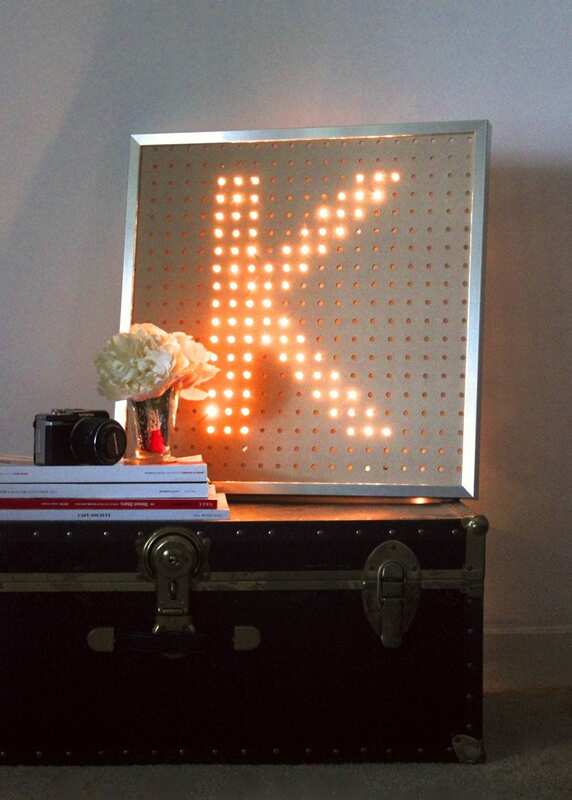 If you’ve got an interestingly shaped light, then a pegboard can look really cool sat in front of it! You can also treat the pegboard as a DIY Lite Brite and poke stringed lights through the back of the board, creating a beautiful and unique piece. This might just be the cheapest way to keep kids entertained! 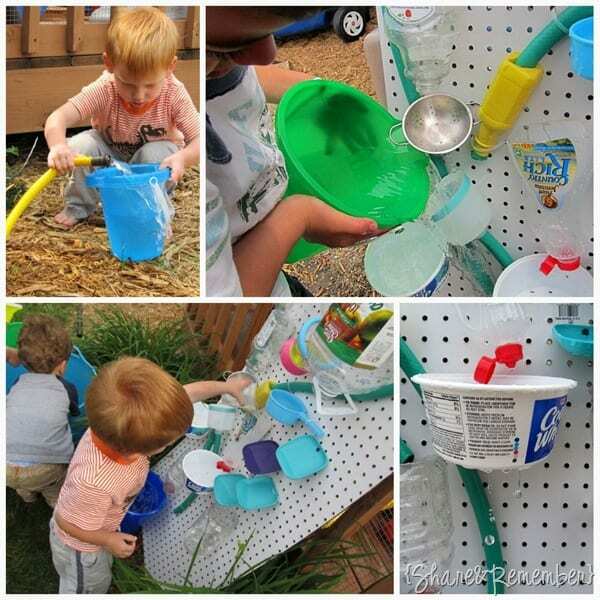 Just give them some items and challenge them to make the water flow in an interesting way. A custom room divider can be made from many materials. 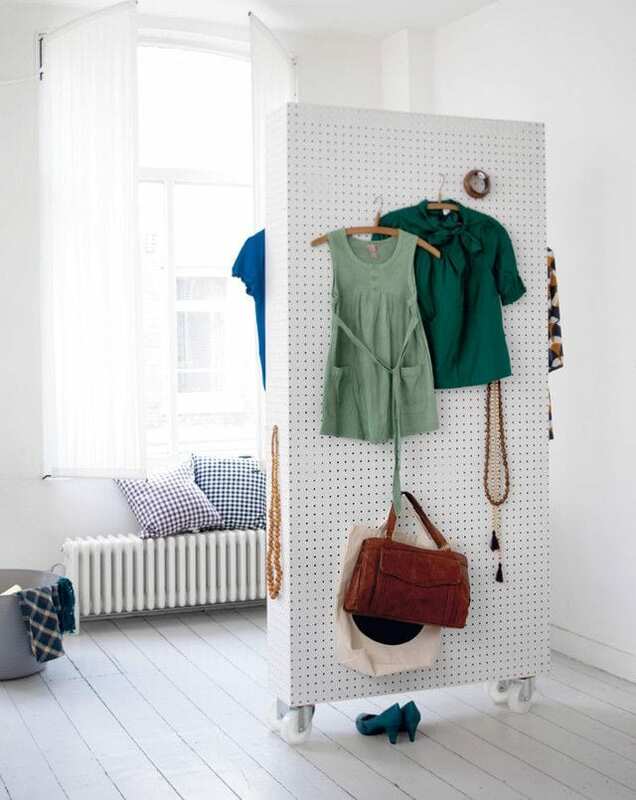 But a pegboard can really allow you to make the most use out of that new object! 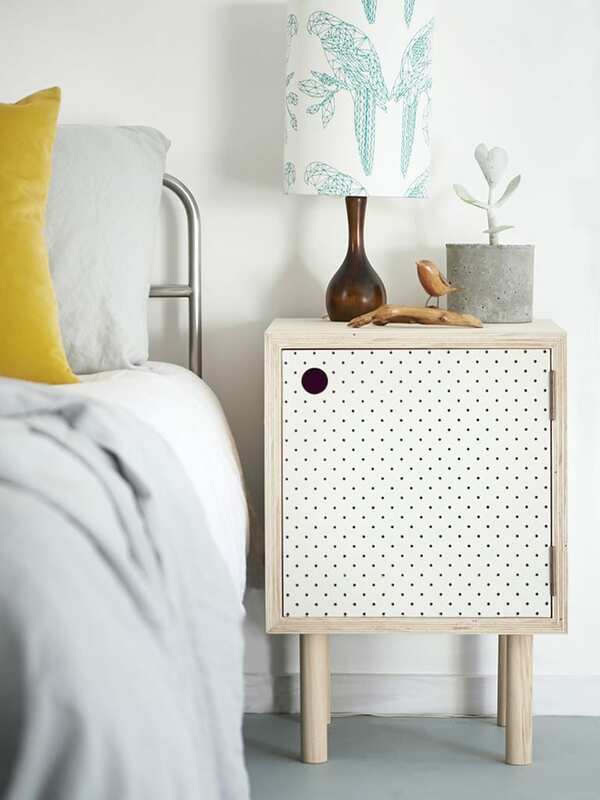 While this pegboard is used as the door to a bedside table, really it can be a door to anything. 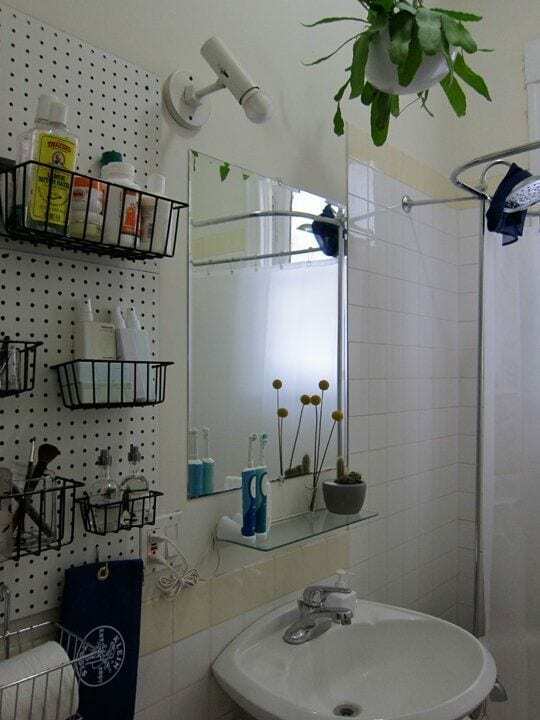 As long as it isn’t a door to something where privacy is key, like a bathroom, a pegboard door will look so unique! Pegboards also look really cool in the bathroom. They can fit towels, shampoos and anything you need! 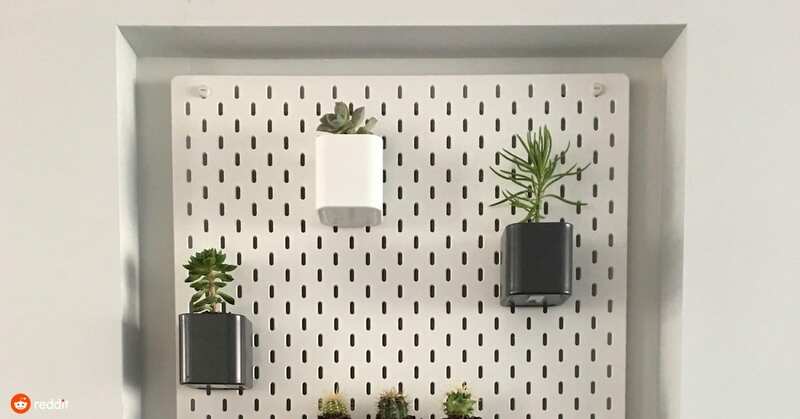 A simple pegboard is perfect for putting your succulents on display. You can keep it as a minimalistic look with a plain white board, or you can get creative by painting it a bright, bold color or pattern. 37.) No Garden Space? No Problem! Living in an apartment or small condo can often mean that you don’t have any outdoor space. 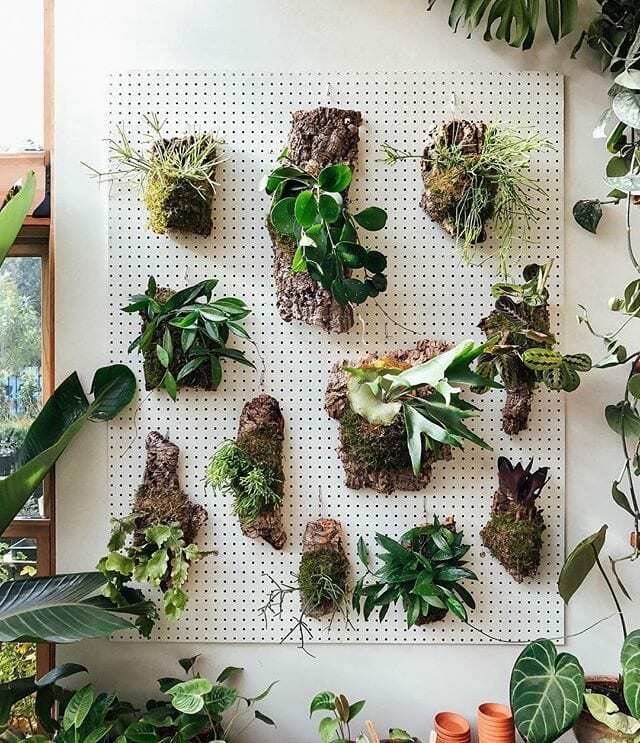 You can create a makeshift garden using a pegboard and some beautiful greenery. Keep it on your patio or somewhere inside your home. Here’s another great idea for people that live in small spaces. Turn a pegboard into, not only a cool headboard but as a functional nightstand as well. Attach a planter or a holder for books, TV remote, or other things you need at an arm’s reach.